We are pleased to announce that The Honorable John Kerin, former Chair of the Crawford Fund, has joined the Fund as a Patron. He is joining three outstanding and recent Chairs of the board, who have shown continuing support for and interest in the Fund and International Agricultural Research for Development. By lending their names to the Fund, Patrons help to build the Fund’s prestige and international standing. We hope to recognise the Patrons’ past contributions to the Fund and to benefit from their outstanding records. Our Patrons will benefit from ongoing involvement with the Crawford Fund, including participation in mentoring and attendance to Crawford Fund annual conferences and State and Territory Committee events. John Kerin is an Australian economist and former Minister—he served as Minister for Primary Industries (1983-1987), Minister for Primary Industries and Energy (1987-1991), Minister for Transport and Communications (1991), Minister for Trade and Overseas Development (1991-1993) and Treasurer (1991) in the Labor government of Bob Hawke. John has a long association with the Fund—after serving on the Board and as chair of the NSW and ACT Committees for some years, he was elected Chair of the Crawford Fund in October 2010. John has also served with the Australian Meat and Livestock Corporation, CSIRO, the Poultry Cooperative Research Centre, the Australian Weed Research Centre, the CRC for Tropical Savannas Management, UNICEF Australia and the National Ovine Johne’s Disease Programme Advisory Committee. 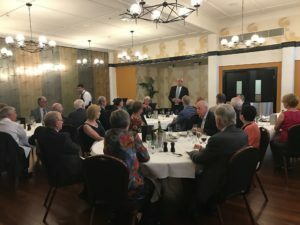 Upon John’s retirement from the Fund, after six years in the role of Crawford Fund Chair, it was announced that he had agreed to be a patron at a farewell dinner on 23 February, attended by the Fund’s board, executive committee and special guests. 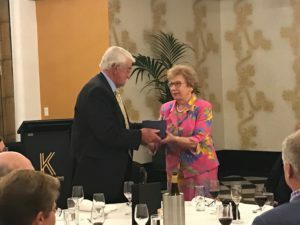 His Patron memento was presented by board member, The Hon Margaret Reid. “John leaves an enormous legacy that I will pursue with, I hope, as much passion, vigour and determination,” said Mr Anderson. You can read more about our Crawford Fund Patrons here.